The year was 1985 and I was attending a convention in New Orleans. It was great to have family with me for a change and as the convention was winding down next day we took a little time out with friends for a cruise on the mighty Mississippi River, As our teenage girls thought it a bit of a bore to be out with “oldies” they’d arranged their own fun for the evening at the hotel. Our girls are travel savvy and were with a peer group who were responsible and knew the way around, so that seemed to be an acceptable plan. We left the conventioneers to their business for the evening and played hooky on the river. The evening was just as we’d expected having been exposed to old US movies favouring romance of early days on the river. Banjos were out in force and active, and we sang along with tourists who’d decided to immerse themselves in New Orleans culture for the evening. It was a never to be forgotten evening shared with friends we’d not see again for several years. In some ways it was a bitter sweet evening for us. We’d lived and worked in India for twenty years and after the convention was finished were planning on a trip to Florida and Disneyworld. We’d then drive back to Washington DC where we’d rented the car, return it, and return permanently to Australia for the girl’s college education. However when we arrived at the hotel we found our girls sound asleep and a note from an expatriate friend who we’d originally met in Pakistan asking me to contact him, no matter what time of night we returned. As it was midnight and we were prone to play tricks on each other it sounded like a good idea to contact him immediately in his room. Surprisingly he was happy to receive our midnight call! He’d recently transferred from Pakistan to Singapore and was on a search committee looking for a financial consultant for an organization covering Asia Pacific region. Would I be interested? If so I was to meet the organizations president next morning at 6 am for an interview. I dived into bed for a few hours sleep, curious to know what the position was, and why the sense of urgency. The interview was brief, the job outline sounded rather challenging and I agreed to think about it and get back to the President later that morning. Of course Georgine and the girls were extremely curious and met me at the door of our room demanding a report on the interview. They seemed interested in the prospect of locating in Singapore for five years as the contract would guarantee our girls education at a North American educational institution of our choice during that time. Not having any particular interest one way or another I went for a walk and left them to chew the offer over. The job would require me to be constantly travelling around East Asia and the Pacific region and I wanted them to feel comfortable with any decision made. This was family business and it needed a joint decision. While on my walk I was hailed by a rather breathless friend associated with international auditing. He’d heard about my job offer and was there to entice me back into auditing service instead. It would mean a change of location to Washington DC. I couldn’t believe it. Two job offers in one day, and both of them with substantial enticements. I decided to return to the hotel room and share this new opportunity with the little family committee sitting to decide on my future. But before I had a chance to wish my auditor friend goodbye others moved in to congratulate me. The Asia Pacific search committee had reported to their Executive Board and they’d called a hasty meeting to approve my appointment. My auditing friend departed feeling cheated and left me in a state of shock. What happened to my request that I’d think about the offer after consulting with my family? How would I explain this to the girls? But I need not have worried. On my return to the room a very excited trio informed me that we should accept the Singapore appointment. Our teenagers were looking forward to their education in the US already. Unfortunately we had to drop the Florida trip as we were wanted in Singapore immediately. Apparently they’d been searching for a suitable finance professional for some time and were getting desperate to fill that position. If I’d had some lingering doubts about the appointment, and a mild resentment that it had been handled in such a hasty manner that was dispelled when we arrived at the Singapore airport! There to meet us was a large crowd from Singapore headquarters office with a big cheery “Welcome to the Grice Family” sign. A warm feeling enveloped us, and it was not the humidity. This was a repeat of the friendliness we’d experienced during our twenty years in India and we were glad we came. But we did detect some concern as the Singaporeans studied their new recruit. What was the problem? Ah, the beard! I’d read somewhere that beards were suspect in Singapore, so after such a friendly welcome I determined to rectify the situation. Next morning I shaved off my beard! Emerging from the bathroom my teenage angels let out a gasp of surprise. “You’re not our Father anymore,” they said in unison and with conviction. But they soon got used to it and welcomed me back into the family again in a short while. The big reward though was to attend office on that first day and see the puzzled looks on those who’d met us at the airport the evening before. Then slow smiles of appreciation appeared on their faces. I’d understood the sensitivities of their culture and cooperated. Heads nodded in approval. That was the beginning of ten wonderful years working in Singapore. This story brought back memories. One day we too received 2 calls. In the morning a call came asking Eddie to teach at a college in the USA and in the afternoon a call to go to Argentina. We chose the USA job but the Lord wanted us in Argentina and to Argentina we went. We never regretted that decision. You folk have certainly made a contribution wherever you went on assignment around the world. It was such a privilege to work with you in the Philippines. Thank you Jane. It’s always nice to see you on my page. What a wonderful and enriching life you have led Ian. Glad this worked out well for you and your family. Considering I came from an insignificant country town that had a gold mining past history I never dreamed in my youth of the opportunities which came my way later on in life. I’ve been fortunate. Not so much because of the high positions I was favoured to occupy, but because of the tremendous opportunity to know and appreciate other cultures and make friends all over the world. Whew! I worried that you ended up regretting Singapore. What a tale, Ian. Not a chance. 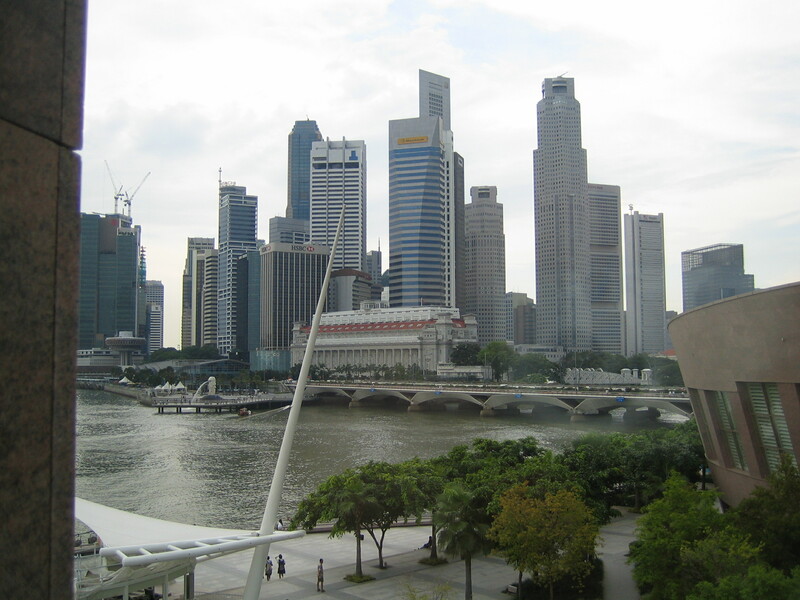 I loved Singapore! And I thought life in ministry was exciting with all the moves we had. Read this with interest and enjoyed the way it was written. It took me right there with you. thanks for an interesting and well written blog. Thank you Barb. You are always so encouraging with your comments. Congratulations, Ian, both on an interesting and well written blog and on the job interview and offer which it depicts. I suggest that your memoirs would make a good book – perhpas this is what you ultimately intend for your grand-children? No, I have never had an interest in writing a book. My stories are for my family and my extended blogging family. lol. You sure do live an exotic life, friend. I live vicariously through you. Well my life is not so exotic now as you put it Elizabeth, lol. but it is great to be retired and not have to travel now I’m older. Yes Yoshiko it was an interesting life but very stressful with all that travel. I loved the 10 years spent in Singapore as a base though. Wonderful city to live in. Isn’t it amazing how sometimes in a moment we make such a large choice. We plan and plan and POP life surprises us. Yes we all find our plans go through unintended modifications many times over in a lifetime. I’ve usually been head hunted and have not had to go through any strenuous job interviews in my life which is rather curious. Usually I’ve ended up finding sufficient challenges to keep me both occupied and interested in each job. Looking back I’ve found myself in charge of organizations whose golden age has passed by and need to be reengineered to place them in the current competitive climate. One gains satisfaction in rescuing such organizations but the stress levels are high.